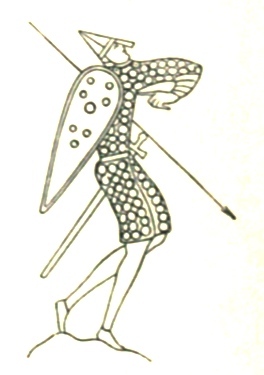 While not exactly clip art, this vintage drawing of Norman Armor certainly has a bit of a cartoonish look to it. This soldier was copied from the Bayeux Tapestry. It was included under the “armor” entry in the 11th edition of the Encyclopedia Britannica. The author makes special mention of the fashionable aspect of the skirt as though it were short breeches. The one-piece armor was called a hawberk. They were generally made of a mail of woven rings, rings sewn onto leather or cotton, or made from padded layers of cotton or linen. The nose guard on the helmets served to protect the face. The disguise was so complete that it is said that King William had to remove his helmet to prove to his knights that he had survived the battle. The Bayeux Tapestry dates back to around 1070 and depicts the Battle of Hastings in 1066. Fussy folks now refer to the tapestry as the Bayeux Embroidery because it is embroidered instead of woven. However it is referred to, it is thought to be the final and best known work of Anglo-Saxon art. I’ve included this warrior and his Norman armor because I thought it was a fun graphical element that might be an interesting addition to more modern and peaceful projects.